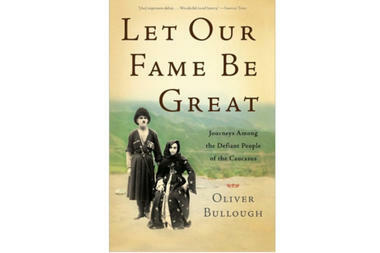 Journalist Oliver Bullough delivers a detailed, moving history of the too often overlooked people of the Caucasus. Perhaps the best way to begin is to be honest. What if we just admit we don’t know much about the Caucasus, that we’re confused by the term "Caucasian,” that we’re not sure who those defiant people are and why we should admire their long resistance to Russian invasion? If that’s our first step, then the second should be to pick a copy of Let Our Fame Be Great, a most compelling history of the region by British journalist Oliver Bullough. Bullough begins by explaining that this region, spanning the Black Sea and the Caspian Sea, was, for more than a thousand years, like an inland island, little subject to outside influences. As for the recent, post-Soviet violent history, I cringe in reflex, but until now I must admit that I knew far too little except that Vladimir Putin in 1999 gathered national political power as he crushed the chaos in the Caucasus with military assaults. So the Caucasus are to Russia what the American southwest might have been had the various native American tribes converted to a common religion and been able to continue frustrating the US and Mexican invaders. From the czars to Stalin to Putin, resistance in the Caucasus to Russian governance and customs has resulted, Bullough argues, in exile or genocide of the natives. Bullough divides the book into four sections, and each is compelling. The history of the Circassians, for instance, who had lived in the region along the eastern coast of the Black Sea for hundreds of years, began losing their independence and freedom in 1764 with the arrival of a Russian army. Thus began Russian policy, which through czars, dictators, and presidents, has been remarkably consistent. The native peoples were usually welcome to completely submit ("Why should we?” – "You’re under arrest for daring to ask!”) and be subject to exile to deserted regions or, if they insisted on defending themselves, they could taste the might of the Russian military.